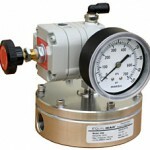 Equilibar’s BD Series back pressure valves with pipe sizes from 1.5″ up through 4″ handle higher flow applications. They use the same precision technology as our small back pressure regulators, but we use terminology “valve” in this case to denote the larger sizes. The BD Series has external elbows attached to the bottom to save significant space compared with side-ported cylindrical designs. Stainless steel and aluminum valve bodies are welded to commercial pipe elbows, while PVC valves are glued to commercial elbows. Flanges can be optionally welded to the elbows if desired. Aluminum elbows are square in shape while stainless steel and PVC are rounded. 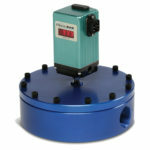 BD valves are used for gases, liquids, and mixed phase applications. For liquid applications, an application engineer will discuss the downstream piping design to make sure that water hammer (resonance) does not cause an issue. *BD-12,16, and 24 stainless steel valves also come in BDM styles for higher pressure. Contact an application engineer or download the brochure for more details. **Height is measured from top surface of regulator to the center of pipe elbow. 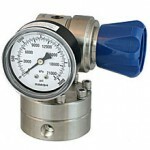 Does not include 3″ manual set point regulator. Research Series Back Pressure Regulators 1/16" to 1/4"
General Service Back Pressure Regulators 1/4" to 1"
Industrial Service Back Pressure Valves 1.5" to 6"
Electronic Back Pressure Regulators 1/4" to 4"